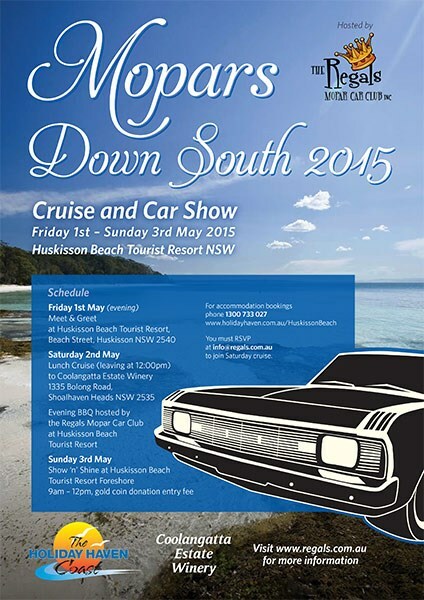 NSW: The Mopars Down South 2015 will include a show 'n' shine on Sunday 3rd May, 2015, at Huskisson Beach Tourist Resort Foreshore. As part of the Mopars Down South 2015 Cruise and Car Show, there will be a Show 'n' Shine on the Huskisson Beach Tourist Restort Foreshore. The Regals Mopar Car Club Inc is a Sydney based club for Mopar fans and will be hosting the event. So if you have a passion for all pre-1981 Australian and American Chryslers, Valiants, Dodges and Plymouths, come to the foreshore between 9:00am - 12:00pm to see the cars and meet the owners.